New Neilpryde RS:Slalom MKIII record!! Yesterday got me some great results, which I didn't expect. I had ordered a Neilpryde RS:Slalom MKIII 5.5, but it was still on its way. Thanks to Martin van Meurs I could still try it on my mast! In the end the wind increased everybody went mad, but the waterstate and angle made it difficult, crash would result. So I called it the end of the day. I think 6.2 was the size of the day, still I am very confident with this sail to break my PR again! Do you walk or surf back? The walk back is also a story. Dylan de Jong had injured his leg, so the first half (like 900m) me and Tim Joosten took his equipment too. That makes total 9.2km distance walking, on that day I have been walking more than speedsurfing. I was talking about walking back after each run. If I take a look on the pictures it seems only a small number of surfers are surfing back. Is it so dificult? I tried 2 times just by pointing upwind, the problem is you are going over +-1m waves in the beginning, you end up in very deep water with also a lot of waves about 400m from shore. Not very nice in 30kn+ wind. It is not a very nice situation since you see the waterflow and combined with the offshore wind you are lost when you get in problems. From there the next sandbank is far away. 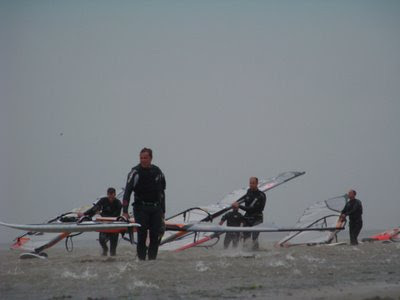 Everybody except I saw Ron Ruiter going upwind a few times. You can imagen with a 20-25cm fin it is hard to keep pointing when you are more than 30% of the time areborn. Good to get some information about the spot! I used a MXT extender on recommended settings. First there was about 0.5cm space left, the third downhaul setting was maximum downhaul. I couldn't pull more it was steel against steel. On the water I felt the 3th setting was about the max, entering the course was a bit easier, and the sail still gave me a lot of drive. I would say the RS:Slalom is easier to go fast, compared to all my full-racesails before. For your interest Chris Lockwood trialled a RSS MkIII 7.0 in February and clocked 43.17. Chris had very high speeds on the 7.0 RSS MKIII, but he also pushed the 7.8 RSS MKIII over 41kn!!! I really think the RS:Slalom is one of the fastest sails in the world!